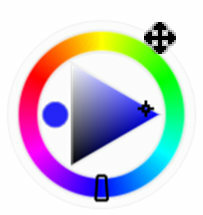 As you can see, the Temporal Colors Palette contains many of the same settings as the Color panel. It's very handy when you're working on a particularly large image and need as much of your workspace real estate as possible. You can hide the other color panels, and just bring up the Temporal Colors Palette as needed. Another excellent use for it is when you want to find a color to add to your painting which will match, harmonize, or contrast nicely with the other colors. To do so, you would move the Temporal Colors Palette over the image until you find the color you wish to match and/or use. If you find that the Temporal Colors Palette pops up in inconvenient places, it's very easy to move. 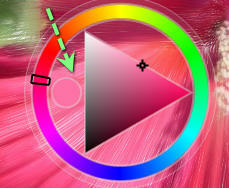 Just hold your cursor over any blank area inside the Hue Ring, left-click, and you can move it any where you wish. Note: When using the Temporal Colors Palette, as soon as you click anywhere outside of it, whether in the document, the workspace, or to call up another window, the Temporal Colors Palette disappears...and that's the reason for the name "Temporal", as in temporary or fleeting. This handy tool is just one of the many new features you will find in Corel® Painter™ 12.